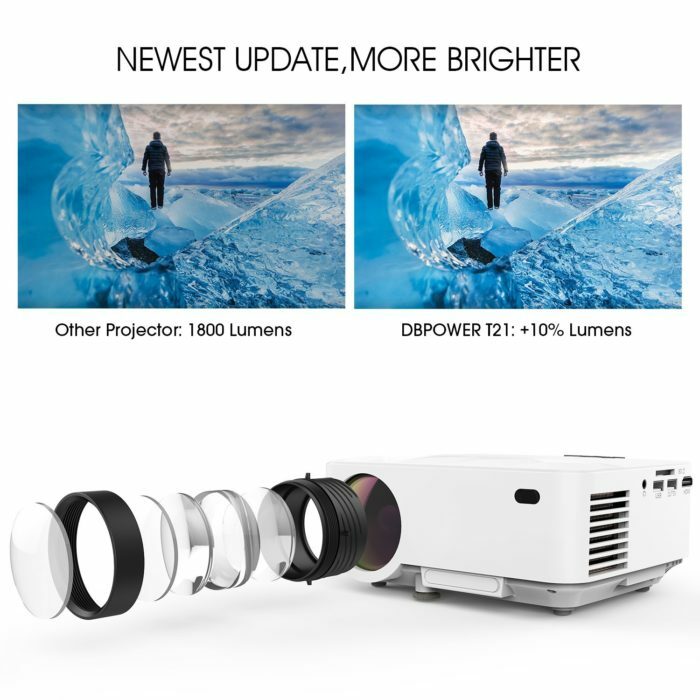 UPGRADED FOR A BRIGHTER IMAGE: This is DBPOWER T20 Projector latest upgraded and is now 10% brighter than previous models, making it better and brighter than comparable projectors on the market. lightweight and portable, suitable for outdoor projection. EASY CONNECTION AND MIRROR DISPLAY: This projector can be connected by USB cable so you can display video from your smartphone, tablet or iPod touch, You don’t need a Wi-Fi environment or HDMI adapter. Real-time synchronization, convenience and stability. 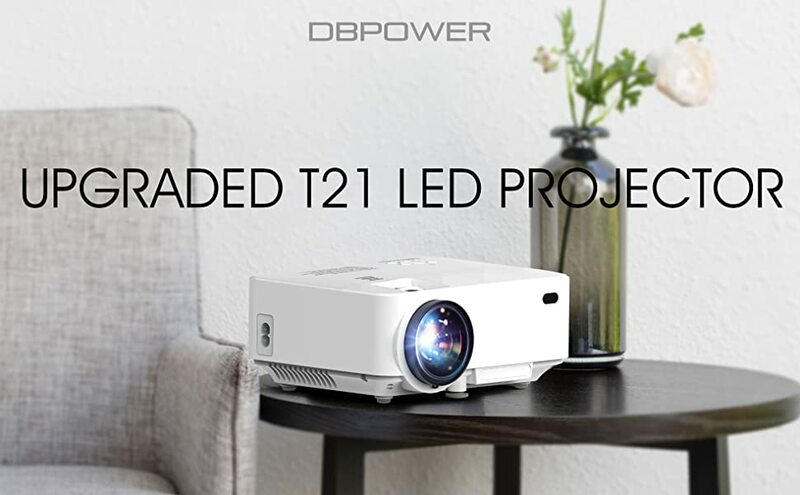 LATEST LED TECHNOLOGY MAKES IT SOFTER ON YOUR EYES: The DBPOWER T21 projector has upgraded LED technology. 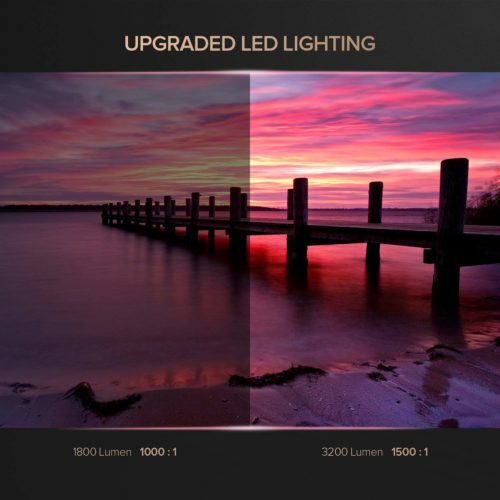 It uses the latest LED passive reflected light technology, making the light softer and easier on the eye for a better visual experience. 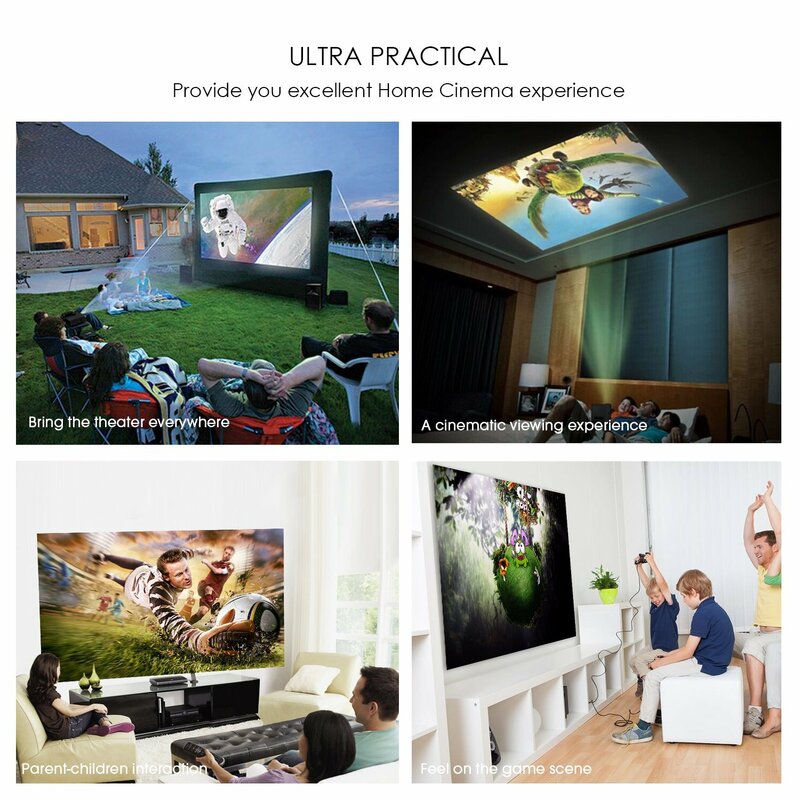 AMAZING VIEWING EXPERIENCE: With a projector distance of 1.5-5m, an image size of 32” to 176” can be achieved. For the best viewing experience, we recommend a projector distance of 2-2.5m with an image size of 130”. first-class home cinema experience. 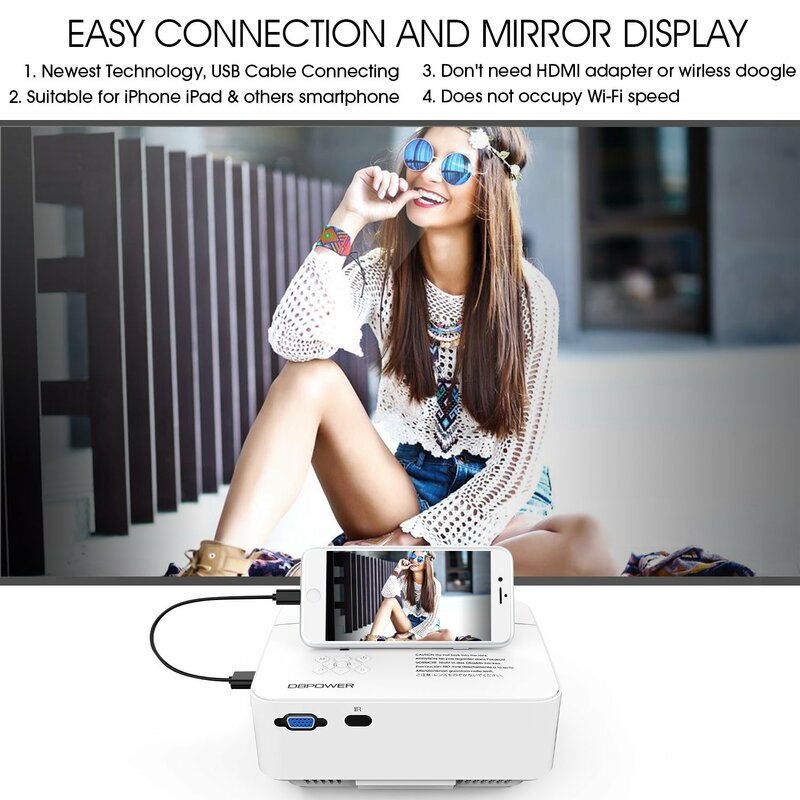 SUPPORTS HDMI VIDEO FOR VERSATILITY: It’s not only your smartphone screen that you can project. Using an HDMI cable, you can connect it up to your TV, computer, smart box, VCD/DVD player and much more, giving you a high-definition video experience. Q1. 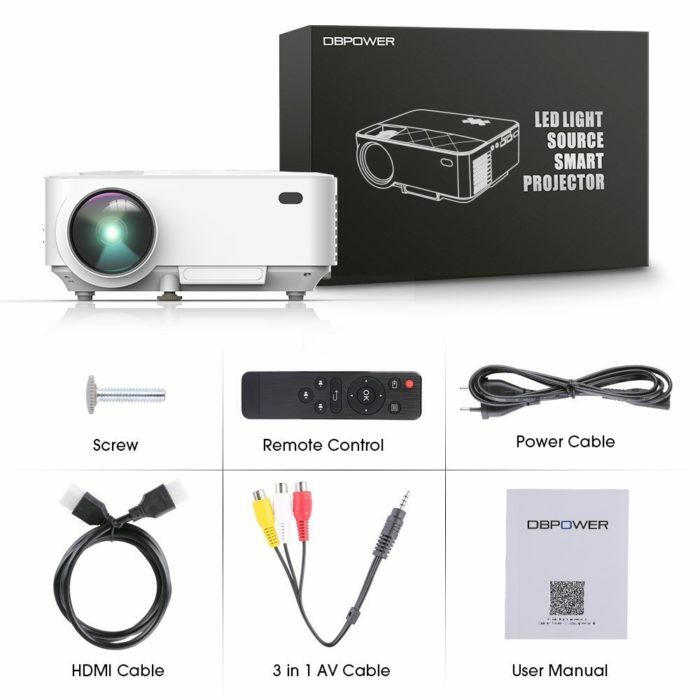 Why should we choose a video projector which is easy to connect and has mirror display? 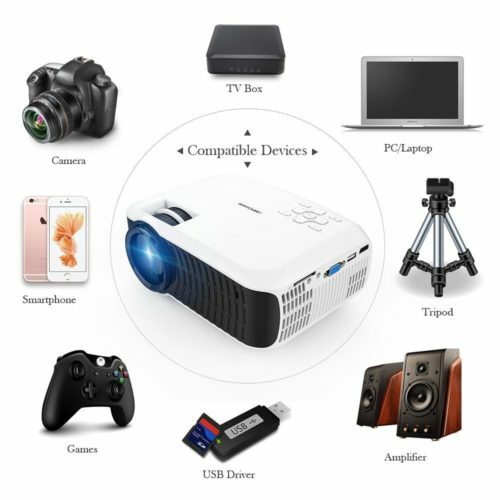 Thanks to DBPOWER’s advanced technology, the T21 projector offers a top home cinema experience for a very reasonable price. 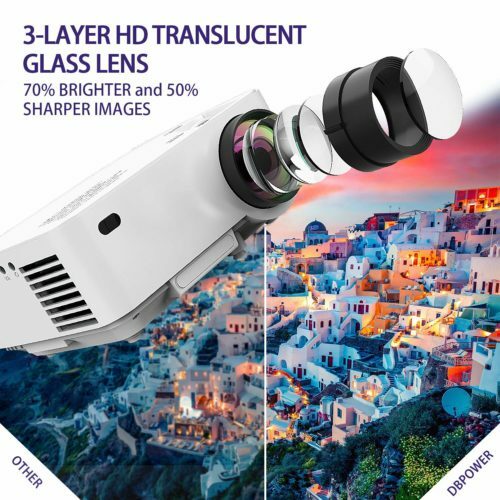 High-fidelity images offer superior quality and convenience of use. 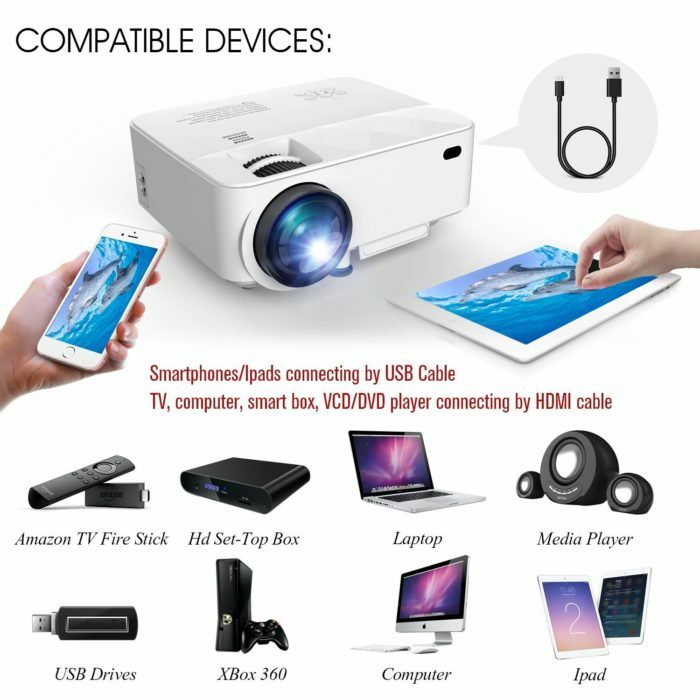 As well as this, you can connect it with your smartphone or tablet via USB cable. Q2. 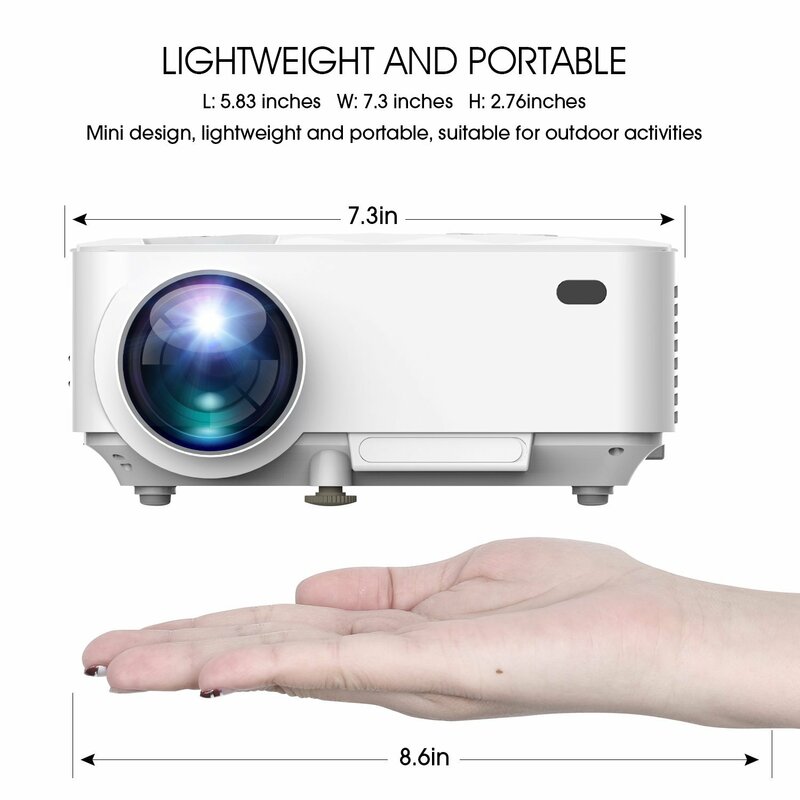 Why choose the DBPOWER T21 portable mini projector? 1) Convenience of use: by simply using a USB cable, you can project your smartphone or tablet screen. 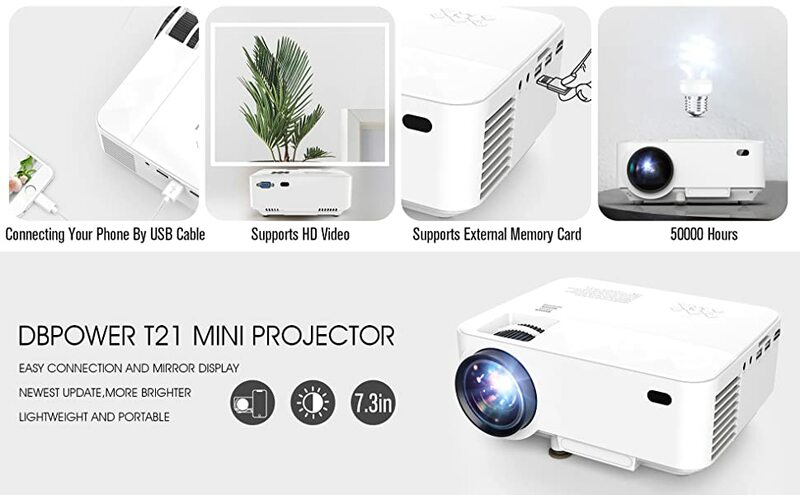 2) Compared to wireless projectors, the T21 uses less energy, making it better for the environment and your pocket! 3) Its operation is also smoother and dongles or HDMI adapters are not needed anymore! 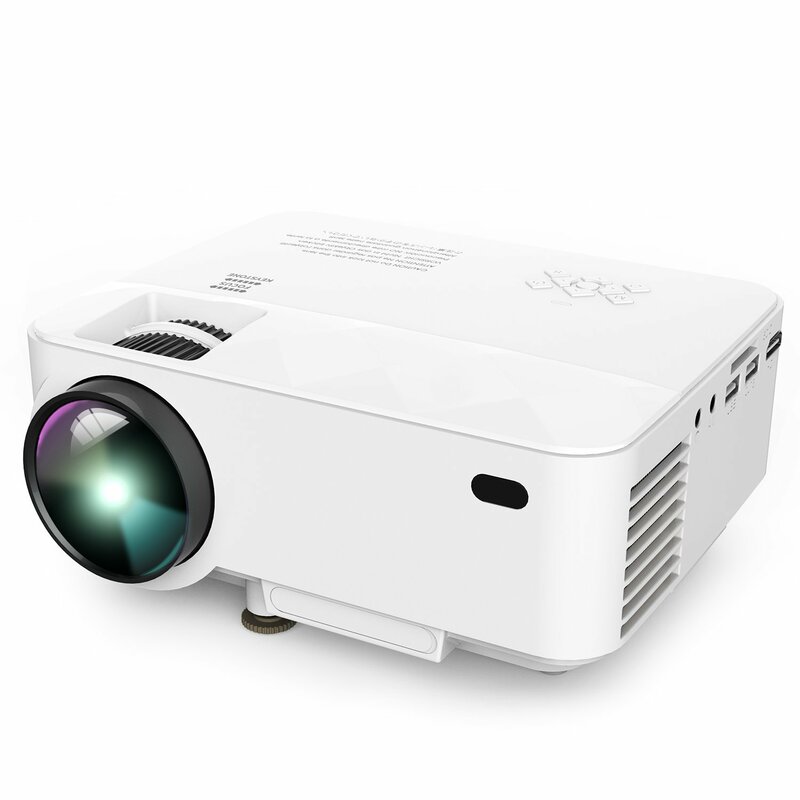 4) The latest LED passive reflected light technology offers a longer service life and is brighter than other projectors. 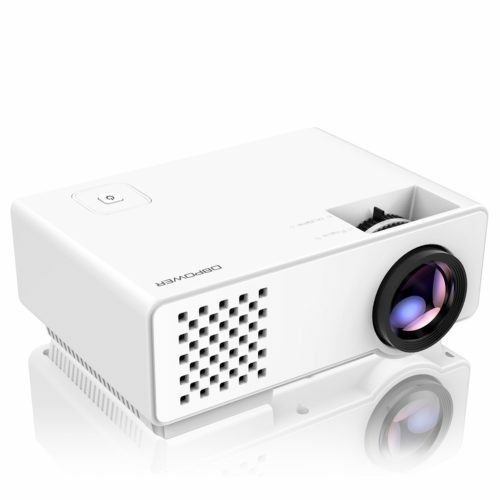 5) Pure copper heat dissipation technology provides higher efficiency, meaning the fan noise is lower than other similar LED projectors. 1) Please turn on wireless hotspot or Airplay when connecting with smartphones. 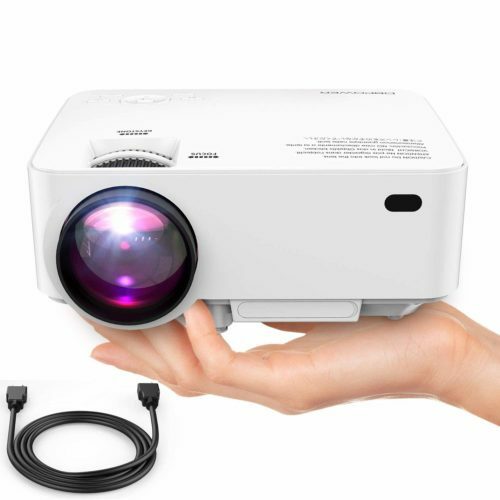 2) To connect the mini video projector with PCs and laptops, please adjust the PC/laptop’s display resolution to 800*600 or 1024*768 for best clarity. 3) Dolby sound is not supported. If there’s no sound, please turn off Dolby Digital in devices such as Apple TV, Blu-Ray players and Amazon Fire Stick etc. Question: Is there a horizontal keystone? Question: How can this connect to an iPhone? And will it play movies from Netflix? Answer: Yes, it works. Connect to 5V USB out port. Turn on personal hot spot with USB only option. Then you will be able to turn on AirPlay screen mirroring. If you don’t get audio, make sure audio option in Netflix video is not 5:1. 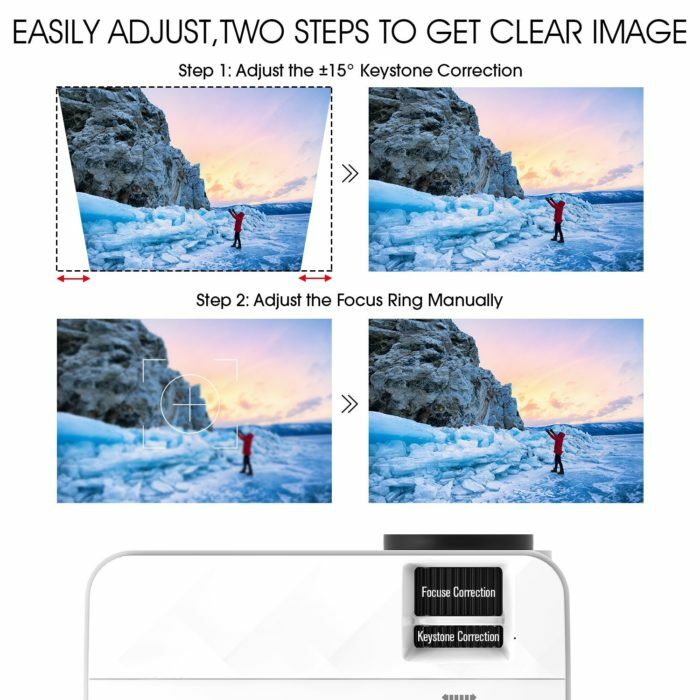 Question: Will a 16:9 screen work for this? 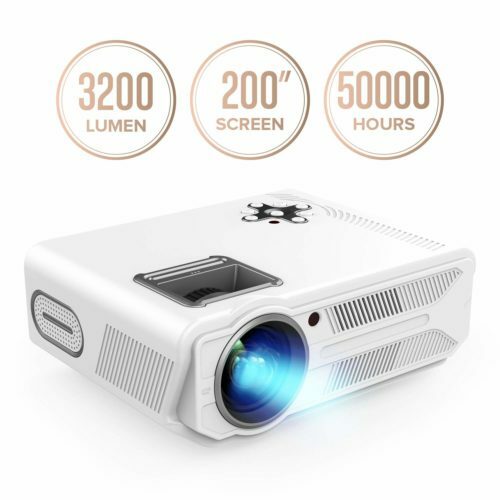 I see in the tech specs that it is a 16:10 projector. Question: Is this a 110v-240v unit? 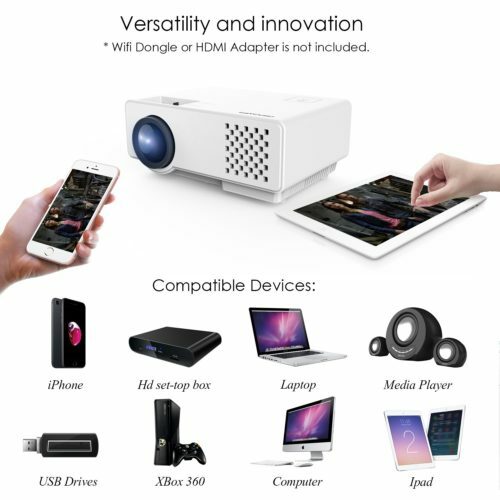 Question: Can I connect an iPhone 7 to this projector using USB and cast the screen without any HDMI adapters or similar things? Question: On netflix and couple other apps when i stream from the iphone (corded) i hear only sound, but there’s no video – how to fix? Answer: Netflix and the other apps don’t work through USB so if you have an apple tv firestick or roku then netflix should work through those. Answer: After reading the description for both, the t21 outputs 300 more lumens. The t21 also has the phone mirroring capabilities as the t20 does not. Question: If you attach an external speaker does it need to have a/v cables or can you bluetooth? Answer: You can pair Bluetooth speakers or a sound bar through an Amazon Fire Stick — this is what I ended up doing and it is working really well. Question: Can i hook a dvd player up to watch movies on a screen? 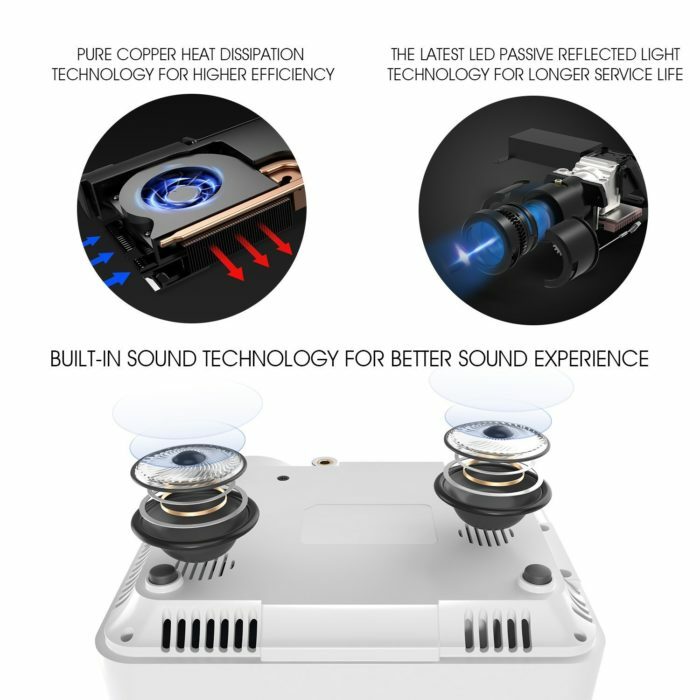 will it play the sound? Answer: Yes, you can hook up dvd player through HDMI/ AV cable and it has decent sound. Question: How do i connect my Galaxy s6 to it? Answer: A y outube video shows someone using a regular usb charging cord input in the usb port that reads usb 5v. Hope this helps. 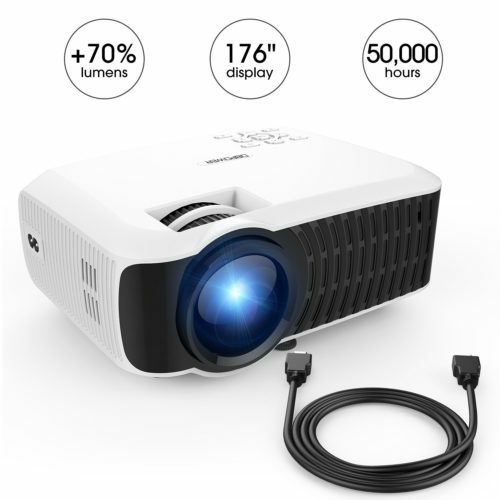 My previous projector has some issues so I bought this one. This one shows clearer images. Happy for this purchase. Nice quality , nice price, nice looking. Just buy it, you won’t regret it! I have one at work, and my son has one for gaming. I love the quality, comfort, and it doesn’t budge at all. These are very large and have stitched edges so they shouldn’t fray any time soon. Serves its purpose as you would expect, doesn’t get too dirty, and is made from fairly resilient material. Size and construction are very good. Smells a bit at first, but after being out of the box for a week that is subsiding considerably. Already bought a second one so I have one at work and home. Works great at my office. Huge mouse pad….works great though….highly recommend. At half the price of some of its competitors, this was a great purchase. It’s big enough to hold my full-sized keyboard, wristwrest, and gaming mouse. The top material is a smooth spandex-like cloth similar to my wristwrest. The bottom is a rubber coating that keeps it from sliding around. Double stitched so it should last a while. Time will tell but I dig it so far and would buy it again. You can’t beat the price and size for this mouse pad its very nice I highly recommend! Incredible gaming mouse pad for the money!! The surface is very smooth. Mouse slides on it with ease! The bottom of the mouse pad has a rubbery surface to ensure it won’t be sliding around your desk. Size is perfect – easily fits my full size keyboard with plenty of room to move the mouse around. I unrolled it on my desk, and within 5 minutes of use, it was settled to be completely flat. The stitching all around the edges is perfect; no loose threads or anything. Smell wise (some mouse pads REEK of rubber!) – there is no strong odor from this mouse pad! a huge plus! It just has a faint smell of neoprene that I assume will completely dissipate within a day or two of usage. For the money, you simply can not beat this mouse pad. My family loves this product. Our friends seen it and want some too. Thank you. Nice big surface to protect my antique desk where my hubby games. This mouse pad is a steal. It is cheap for gamers on a budget. BEST MOUSE PAD EVER (for the money)! Looks more expensive than $2.99. Looks like it costs more than $2.99. Optical mouse works good on it. Great surface texture mouse pad is large enough to accommodate both mouse and keyboard good fabric padding allows for optimum speed and accurate control while gaming very good stitching good quality and inexpensive thank you. Great value for product. I previously had a Pecham one of similar dimensions that’s being used on another computer desk which was about twice the price. This DB one is a little more slippery than I thought it would be coming from the Pecham but honestly no complaints there. It’s a little longer than I expected, but it’s true to size, no slip or budging from the mat itself, and I’d imagine it’d be a lot easier to clean as well. I use a G602 and with this mat, there’s slightly less friction compared to the Pecham, which is expected, which indirectly offsets the weight of the mouse which is nice. The stitch work around the border to keep it from fraying is great. I’ve seen plenty of mats out there where there’s shoddy work done and you get an overstitch at one point with two layers, and it makes it awkward, especially when it’s right there by the wrist area. Would definitely recommend this to anyone that needs a gaming mat for a few bucks. Flawless packaging. It looks like a nice bottle of ethylic alcohol. Performance wise, it feels awesome and is nice to the touch of the mouse. This is a nice gaming mat. Thick, heavyweight material that rolls out easily and has nicely braided edges for durability. Has a nice even matte surface that laser sensors love. Doesn’t really pick up that much dirt or oil from your hand; it’s still looking as clean as the day I took it out of the box. Great mouse pad for the price. Have some thickess to it and the bottom is anti-slippery. Large enough for any purpose and well manufactured. Helps a lot to smooth and easy mouse movement. Good quality mouse pad. Stuck well to the surface without moving. Let it air out and its a good mouse pad. Box was pretty beat up but the mouse pad was in good condition. Works well with my G602 mouse without any issues. Nice smooth texture and lays nice and flat after a couple of days. The only negative is that it still has a strong smell after a week of opening. This is a fantastic gaming mat! I purchased two. One for work and one for home. Sadly, my days of gaming are over, but they make an incredible work mat for small electronics projects, repairing laptops, tablets, phones, etc. Love it–mouse works much better! Great investment. Excellent mouse pad, doesn’t hurt your hand over time. I have both this mouse pad and INSTEN mouse pad at home. INSTEN mouse pad hurts my hand over time but this one doesn’t. I should have bought this product instead! Very great mouse pad! It sits down nice and is the perfect size. The packaging was a little messy, but it wasn’t a Christmas gift so that didn’t bother me too much. Dbpower mouse pad are legit. Great mouse pad for the value. Size is great and feels comfortable on my wrist. I really like this mouse pad. It is large. I dont have to lift my mouse and reposition it. The large pad really is convenient. It is also thick ans comfortable. I use it at work and replaced the small thin pad. It helps alot. Highly reocmmended. Regularly on sale for $3 if you can find a code. Works fine. Feels a little like a wetsuit. I got this after I got a coupon online and I love it!!!!! Good Looking and Great Quality. This mouse pad is amazing. Can’t get better than this except if you want an led one which not many people want. This is good quality, quite bigger than expected, and looks great. Very good price as well. Love it. Soft to the touch and smooth tracking. This mouse pad has a traditional thickness to it so if you are looking for a ultra thin pad this is not for you. Great quality at a fantastic price. Very well mouse pad. My mouse works so smoothing on this pad. And the size is so large that covers every movement of the mouse. Good product.